I originally intended to make a Kahlua based cocktail using the components of a White Russian; using ice cream in lieu of half and half and adding some ice cubes with a resulting Frozen White Russian. The problem with that? Just not feeling anything Russian right now although the name would be appropriate; it feels like the Cold War again! Is Putin the grandson of Kruschev or something? 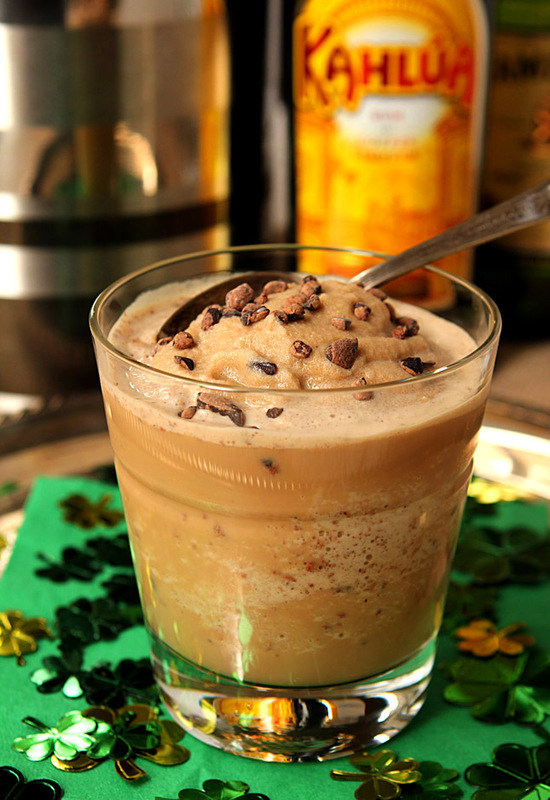 I decided to segue and came up with a combination for an Espresso, Kahlua and Irish Whiskey Frozen Cocktail that would also honor of two upcoming special days. One is obvious; I’m part Irish (just a bit from a grandfather on my mom’s side) and I do love Irish Whiskey so something for St Paddy’s Day is imperative.This year though we’ve got more to celebrate. Thinking ahead and in honor of our moving our clocks the same direction, Kahlua has asked me to help celebrate National ‘Cocktail Your Coffee Day’ on Monday (#cocktailyourcoffee). Knowing we’ll all be a bit wearier as we navigate through the first day of Daylight Savings; we’re thinking your coffee needs a bit of Kahlua to celebrate this eventful day. Vodka was out, espresso was in and I’m telling you this is one great dessert cocktail (she says as she sits here sipping it this morning; please promise to ignore any typos!). Join us and let us know when you’ve taken a sip of your favorite coffee cocktail in an effort to thwart the effects of Daylight Savings! 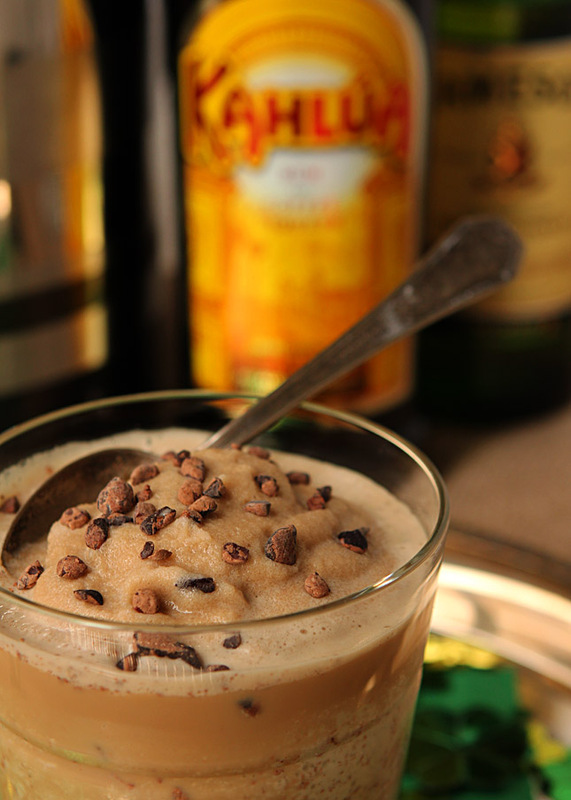 Of course it can be as simple as just pouring a shot into a hot cup of coffee, but if you want some additional ideas on incorporating Kahlua with coffee, visit Kahlua’s website and consider an Espresso Martini or Café Con Leche Iced. I’m not sure I will ever mix Kahlua and vodka with cream again; this was such a successful veering off the beaten path; I LOVE it. Richer and less biting with the Irish Liqueur instead of vodka; it’s truly a winner. I think good enough to plan twice. Have one on Monday and celebrate everything about the advent of spring, including days that will be warm enough to sit outdoors in the evening and sip a cool, icy cocktail. I can’t wait after this winter, how about you? Still, make sure you bring it into rotation for St. Patrick’s Day too…what a great way to add some Irish Whiskey to a celebration; I just can not believe I’ve not done this before! Add all ingredients to a blender and blend until smooth. Pour into chilled rocks glasses and garnish with cocoa nibs or shaved chocolate. I was provided with a bottle of Kahlua for review however all opinions are my own. i like that type of coffee. i tried Irish coffee, i have a small post about it on my site if you like chec it. I’m writing to you because of your exquisite recepie. I was wondering if I can publish that recepie (quoting your name of course) in our facebook fan page and in our blog. Is it possible? Just thinking in adding our logo into the picture. And thanks Jenni…it was really good. I tested it in the AM too. That was fun! That looks absolutely delicious! Many thanks for the share, I will make sure to give it a try in the near future! What a creative combination! And how in the world did I miss National “Cocktail Your Coffee Day?” I could have used a little kick today and this looks like just the thing! This is lovely. I NEED this. Right now. Can you make a big Pitcher? The Irish in me loves this. The Kahlua lover in me loves this. The “I can’t wait for Spring” in me loves this. Really…what’s not to love?! Exactly. Barb loves this. I think I need another! Oh how I love Kahlua! Me too; I can drink it straight! Well I am not sure I can cocktail my coffee on a Monday morning…not always the best way for a mom to start the week but I sure can try it on a Sunday evening, right? You’ve made a great combination here with this chilly drink and I would love to share one with you! Well I’m a tiny part Irish, and it’s sure been chilly here, so a Chilly Irishman is pretty appropriate, I’d say! This looks great — very clever cocktail. Definitely a winner. Thanks.